OUR OTHER CURRENTLY FEATURED BOOK, “HEART, SOUL & ROCK N’ ROLL,” BY JANET R. STAFFORD, CAN BE FOUND BY SCROLLING DOWN DIRECTLY BELOW THIS POST. SUMMARY: Letters discovered in a tin box hidden in the foundation of a small cottage in Normandy reveal a terrible secret. Antoine Bouchard’s beautiful wife Marianne, his precious daughter Ariéle, missing. The lives of hundreds – perhaps thousands – of allied soldiers preparing to storm Juno Beach on D-Day literally are in his hands. Antoine must choose – to find Marianne and Ariéle, or face Hell even if it means he could lose his family, his only friend, and his life. THE BACK STORY: I discovered my grandfather’s WWI journals and took them with me to France. I visited all of the places he wrote about and discovered a hidden story between the entries. He sailed to France to be an engineer – when he returned to America he joined the clergy and served as an army chaplain and later a chaplain for the Veterans Administration. The story of why he made such a profound change and its impact on a German prisoner of French extract is at the core of this WWII drama. This is a time-slip novel – the main character in the present must solve the mystery of Antoine by traveling to France and digging through the past. What he discovers is one of the little-known secrets of D-Day, one that could have changed the entire course of western history. WHY THI S TITLE? : The letters intended for my grandfather from the small French port of Courseulles-sur-Mer during WWII form the basis of the mystery. Who was Antoine? – no one in the family knows. Why is Grandpa ‘Andy’ Anderson corresponding with this man in France? My grandfather served in the Pacific theater during WWII. Why does the mysterious Antoine write in his last letter “I fear I will die this day” – June 6, 1944. D-Day in Europe. The story climaxes on Juno Beach where the Canadian forces landed on D-Day and weaves together the lives of those caught in the middle of the two great wars of the twentieth century. WHY WOULD SOMEONE WANT TO READ IT: This is a story about small characters and small events that by accident had compelling consequences for the men landing of the beaches of Normandy and, through their efforts, the fate of World War II in Europe. I look at the world-shaking events of the time through their eyes and bring the stories of many who lived through this catastrophe to life. “This is such a fascinating story for anyone interested in WWI and WWII… . and the bravery of the resistance and allies working behind enemy lines. The question is, what happens to Antoine, Marianne and Ariéle? To find out you will have to read the book or listen to the audiobook version. “After a week of these clandestine bribes, Bouchard P64335 passed behind Private Andy Anderson during a morning’s mess, and simply stated “Antoine. Antoine Bouchard. – The Juno Letters. AUTHOR PROFILE: I have coffee most every morning at my “office” – a small table in a 1920s style restaurant and hotel called the Olympic Club in Centralia, Washington. Visitors assume I work there, some think I am the manager. I have led an interesting life – married thirty-five years, have three children, six grandchildren, and twenty-five foster children. I am now free to pursue my passion for writing – especially about the two great wars of the twentieth century. So I cherish my role as “author-in-residence,” or that crazy guy at the table by the urinals – it depends on your perspective. 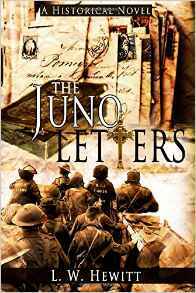 AUTHOR COMMENTS: The Juno Letters is based on two cherished beliefs, gleaned from years of research and interest in WWII. The first is that the stories of people caught in the maelstrom of war provide the most fertile ground for storytelling. I research my stories thoroughly and create fiction that honestly could have happened and blur the separation between reality and fiction. The second belief is that we may write about history as a series of causal actions that flow from one to another, planned and executed. The reality is that chance and mistakes often dictate the course of the world’s greatest events. Embedding such a chance happening within a novel makes for a great story. LOCAL OUTLETS: If you are at the Juno Beach Centre in Courseulles-sur-Mer you can buy a paperback copy in the bookstore at the exact spot where the story climaxes. WHERE ELSE TO BUY IT: Amazon, Smashwords, Apple/iTunes (an enhanced multitouch edition), Barnes & Noble, Inktera, and the subscription services Scribd and Oyster Books. It is available in print from CreateSpace and Lulu, and in Audiobook format from audible.com.